When I received my endowment a month before I left on my mission, I had no idea what covenants I would be required to make. I prepared myself as thoroughly as I possibly could. I read The Pearl of Great Price twice because my dad told me a lot of the endowment content could be found there. I attended two temple prep classes, one in my singles’ ward and one in the home of my family ward former bishopric member. I even read Boyd K. Packer’s The Holy Temple, which, as far as I could tell, revealed absolutely nothing about the endowment ceremony in 200+ bone dry pages. I fasted and prayed and studied and confided my anxieties about the unknowns of the temple to my mom and my priesthood leaders, who reassured me I’d be fine. I could hear her voice cut through the unison female voices as we chorused “Yes.” My voice rasped like a door slamming shut. Afterward, I felt like I couldn’t bring it up, like that part of the endowment was a dirty secret we weren’t allowed to mention. To talk about it would be to acknowledge the disparity, to suggest that it wasn’t normal, to admit that there was a snake in Eden. I’m going to suggest another Mormon-specific variant: sacred creep. Sacred creep occurs when topics that should be fair game for discussion are labeled “sacred” to shut down discourse. We’ve witnessed this in regard to Heavenly Mother for decades: the cultural narrative has been that we aren’t supposed to speculate about her because she’s “too sacred” to talk about. Sacred creep also manifests when we feel we can’t question things because it would challenge the status quo: the assumption is that the reason things are the way they are is because that’s how God wants it, i.e. it’s sacred. Gender roles laid out in the Family Proclamation are labeled “divine design” and “sacred responsibilities,” placing them above critique. Questioning anything that is considered sacred and thus divinely appointed is treated like steadying the ark or corrupting divine doctrinal pearls with grubby human hands. The “creep” phenomenon is not limited to sacred things: there is also “standards creep.” Members of the Church are so anxious to keep the rules, we often become more and more conservative “just to be safe” and to avoid crossing a line inadvertently. Despite correlated policies, we see the phenomenon of “looking beyond the mark” from both leaders and individual members in everything from what women are allowed to do in our wards (“women can’t be in a church building without a priesthood holder”) to the dress code we abide by (“women should dress to cover garments even if they haven’t been endowed”) to the tithing we pay (“tithing must be 10% of gross, not net”) to the food we eat (“no coffee flavored ice cream”). It’s fine to have personal codes that differ from the group, but when these unnecessarily strict standards creep into talks or lessons and are projected onto other people or lauded as being extra righteous by members or leaders, it’s a problem. Sacred creep is the secrets version of the Pharisees’ treatment of the Law of Moses: if not revealing the signs and tokens of the temple is the rule, then not disclosing the covenants is even better, and avoiding speaking about the content of the ordinances except in the vaguest of generalities is safest of all. We label them sacred and thus taboo, building so many fences to keep us from the edge that we forget where the edge was to begin with. Case in point is the concluding sentence in the First Presidency’s public statement coinciding with the temple changes: “A dedicated temple is the most holy of any place of worship on the earth. Its ordinances are sacred and are not discussed outside a holy temple.” Apart from being a much broader nondisclosure mandate than we actually covenant to in the temple and a major instance of sacred creep, this directive serves both to discourage members from processing the temple changes or problems together and to discredit the people and entities that speak and write about the temple. The irony is that the temple changes came about precisely because women spoke up about the problematic aspects of the ordinances: members who hadn’t attended the temple in awhile were sent surveys asking about their experiences, and dozens of men and women were interviewed at length by the correlation department in the months before the new script was rolled out. Women giving voice to their experiences directly informed the changes that were made. But now we’re being told we can’t speak: not about the ordinances themselves, not about the changes, not even about the fact that changes have occurred. Silencing–particularly of marginalized groups–is a weapon of oppression, and it has been used against women in the Church for nearly two hundred years. In every context I can think of–professional, religious, political, relationships–people must be permitted to discuss things they find problematic or troubling because secrecy, even and especially about sacred things, creates an environment where abuses can occur unchecked. Not allowing discussion of the temple changes erases women’s pain and experiences as well as minimizes legitimate questions about what these changes mean. Unlike priesthood creep, which, because it’s often codified in policy, we generally can’t do much to change, combating sacred creep is possible. If we resist the cultural norms that encourage silence, we can reclaim ground from sacred creep by speaking out about problematic (or beneficial!) aspects of our doctrine and practice. When others use sacredness as an invocation for silence, we can respectfully push back with reasons why discussion is important. We can point out the glaring absence of Heavenly Mother in our theology and assert that the “she’s too sacred to talk about” rhetoric is not doctrinal. When someone attempts to shut down conversation about the changes or the sexism inherent in the temple, we can share our experiences while explaining that it does not violate our covenants to do so and that sacred does not mean secret. When pushing back against doctrines that are harmful for many, like gender roles or LGBT issues, we can assert that understanding of what doctrine is evolves over time and point to the Adam God doctrine, the temple changes, polygamy, and the temple and priesthood ban for blacks as examples. I will fight sacred creep in my personal sphere by teaching my daughters and my son exactly what they will covenant in the temple and by modeling that no facet of the gospel is too sacred to examine, talk about or question. If we use our voices to break the silence, we’ll break the taboos. Next story Guest Post: I Broke Up with God Because of the Temple. Now What? 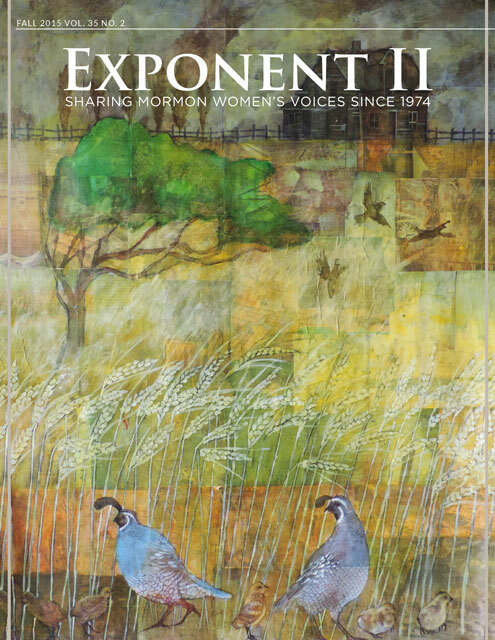 Previous story Exponent II Winter 2019: Subscribe! Just a thought. Do you not worry that discussing the changes brings up the very thing you are trying to stop. I causes people to decide why the changes were introduced, how the process happened, and why they do, or do not, matter. On this board a variety of scenarios have been mentioned. Also things that should have been done as well. Some of these may be correct, but some too may not be. And as they are discussed, and re-discussed, “change creep” will inevitably come in to play. Either these changes came with God’s approval, or they didn’t. How and why they came about it of little importance compared with whether they have God’s approval, IMO. If the Endowment changed because of surveys and interviews, with no revelation, then this is no longer (and therefore never was) the Lord’s church. I never said there was no revelation involved, but I think Mormons have this idea that revelation to the prophet consists of 1. the prophet praying and 2. the prophet feeling inspired to make changes. The reality is that revelation doesn’t happen in a vacuum, and there is a LOT that goes into making these changes (committees, disagreements, surveys, interviews, pilot programs, lawyers…). I believe that transparency is important for any organization, and we get precious little of it in the Church. But no one else is in the room where it happens. We just assume that it happens. “How and why” changes came about may not be important to you, but it is to many of us because it helps us know whether leaders are listening, whether they’re aware, whether they care. annarachelb, any day I can use Hamilton lyrics in an argument is a good day. I think your assessment of how revelation happens at the general level is short sighted. If you think that surveys and interviews were NOT part of the revelation process, you’re mistaken. Certainly there was some seeking answers from the divine, but also in seeking answers from the people he serves. This is a positive feature of his leadership. Thank you. I really appreciate how you articulate priesthood creep and sacred creep. I have been trying to combat these with my local leaders, but still too many leaders and members shun questioning. I think they fear that asking questions will lead to apostasy, or is a show of weakness or lack of faith. We probably all know people infected by various versions of sacred creep (e.g. Pepsi is against the WoW, or even chocolate! ; 4 year old girls can’t wear sun dresses; you must wear church clothes all day on Sunday; you don’t dare have an opinion different from your stake president; all scriptures are literally the direct word of God; mothers must stay at home with the kids to prove their righteousness). Pay, pray, and obey – everything I say! We can and should ask questions without being combative or disrespectful. We can only learn and grow when we ask the difficult questions. I wish the church as an institution would embrace that. But my fear is that they know too many of the questions don’t have answers, or the answers might harm the church as they see it. Again, thank you. I loved your insight. Sacred creep is when we are increasingly unable to talk about subjects: they are off limits because they’re labeled sacred. Standards creep is when we make extra rules as hedges around the actual rules. And there’s nothing wrong with “standards creep” on a personal level: each of us should be free to interpret rules according to our individual needs–the problem is when the creeping standards are applied to everyone. Good for you for speaking out in your sphere–I agree that standards creep is something we can fight against, too. It’s interesting that the Church published four new temple videos on The Mormon Channel on YouTube, including one on the covenants we make during the Endowment, and then a month later tells us not to talk about anything in the temple. So we can link to videos, but we can’t speak about them? You are simply not allowed to decide for yourself what to think about these things. You can either believe the narrative that has been fed to you by church leaders, or you’re not allowed to think about it at all. Those are your choices, ladies! exactly; THEY get to control the narrative and we aren’t invited or even allowed to contribute. They completely ignore the fact that our ancestors built this faith and sacrificed their lives to build it and that we are sacrificing our lives, time/talents, children, spouses, and incomes to keep it running–we aren’t allowed any say in the narrative. I am not super happy about this. Great point, PassTheChips, and thanks for sharing this video–I hadn’t seen it before. Brilliant analysis. I think you’re spot on. Wonderful article! It’s important to talk about certain issues, so that we can figure out how to solve them. Ignoring the problems, won’t make them go away. The newest changes to the LDS temple ceremony are unprecedented and are a signal of apostasy in the church. In 1990, and prior, there were changes to the wording and removal of portions of the ceremony in the temple. A changing in wording doesn’t always lead to a change in the underlying meaning of the covenant being made. However these most recent changes have changed the covenant. A removal of a covenant is not the same as a change in the covenant. A removal of portions of the ceremony doesn’t necessarily imply that the covenant has changed but rather it was just taken away. However, the covenants that both men and women make in the temple have changed. Women no longer covenant to obey the law of their husbands but rather covenant to obey God directly. If you are not familiar with that wording it may because the wording was changed in 1990 to say the law of the lord. Even with the change in 1990, Eve is addressing Adam when she makes that covenant, not God. She promises to obey Adam and in return she will become Adam’s priestess. Now Eve covenants directly with Elohim to obey him and in return she will be a priestess to him instead of Adam. So which covenant did Eve make in the garden and what were the promised blessings? It can’t be both. This begs the question if these changes are retroactive? Do not say that changing who you covenant with is not an issue. I covenanted with my husband to give myself to him and he covenanted to receive me. If the person in the covenant can change that implies that I can change who I can covenant with regardless of my righteousness because the recent temple covenant changes were changed without regards to the worthiness of a single individual. Also from now on husbands covenant to give themselves to their wives instead of just receive. This sounds like the door for polygamy has been shut. Which would be fine with me but again are these changes retroactive? Also husbands now covenant to preside over their families. This was not in the original covenant. Sigh. Unfortunately the covenants have changed. And I don’t know what this actually means for me or my future daughters that have yet to go through the temple. Glad you pointed this out. All of a sudden, from here on out entire generations of women are making completely different covenants than I did. It is almost a separate ordinance! So what, am I just left out in the cold with my defunct ordinance that I did pre-2019? Grandfathered in? Do I need a renewal? Nobody is addressing how the changes affect those of us who made the old covenants. We are being ignored, and it infuriates us because women in my generation were excommunicated for complaining about these things in the first place, and now we are being ignored AGAIN while the younger gals get OUR wishes granted for THEM. This is beyond insulting for the women of my generation. ElleK, you’ve hit on something really important and pervasive here that I haven’t been able to find the words to for a long time. I’m also wondering if this might be part of the reason that we have such.a.hard.time talking about potential changes in the church. Sometimes I feel like we’re also dealing with “contention creep.” So many times when someone brings an unorthodox opinion, question or desire to the table, they’re told it’s sewing seeds of contention (I wish I could count how many times this was mentioned in conversations about women’s ordination). No longer is contention about actually fighting with your fellow ward members, it’s about the potential for disagreement. The result is that we’ve all become so scared of the potential of disagreement that we really don’t know how to have deep conversations that push us to consider different viewpoints. We’ve raised the banner of “harmony” so high that we’re dealing with perpetual major triads that go nowhere and make for some pretty dull, stagnant music. Great points, Amy! My last RS President’s greatest fear was that people would disagree during a RS lesson. All the comments were the same viewpoint, supporting the same narrative. “Contention creep” = calling cognitive dissonance or differences of opinion “contention” and thus “of the devil.” I have definitely seen that play out, too. This is such a great post, ElleK! Thanks for providing a name for this phenomenon and describing it so perfectly.